Automatically start Kibana whenever your computer reboots and keep it running 24x7 in the background. No logon necessary. Kibana is an open source data visualization plugin for Elasticsearch. It is the "K" in the popular ELK stack. 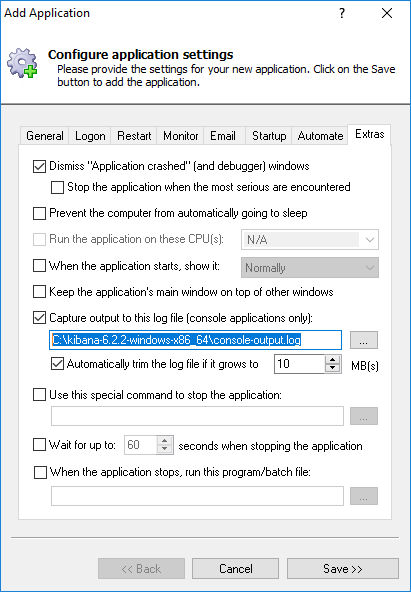 Elasticsearch already runs as a Windows Service, and we have already documented how to setup Logstash to run 24x7. This tutorial focuses on Kibana — to ensure that your entire Elastic Stack easily survives reboots and other outages. If necessary, download, install and configure Kibana. Grab the Kibana zip file from the Elastic web site and expand its contents to a location of your choice. We have unzipped version 6.22 to C:\kibana-6.2.2-windows-x86_64 and we'll use that folder throughout this tutorial. 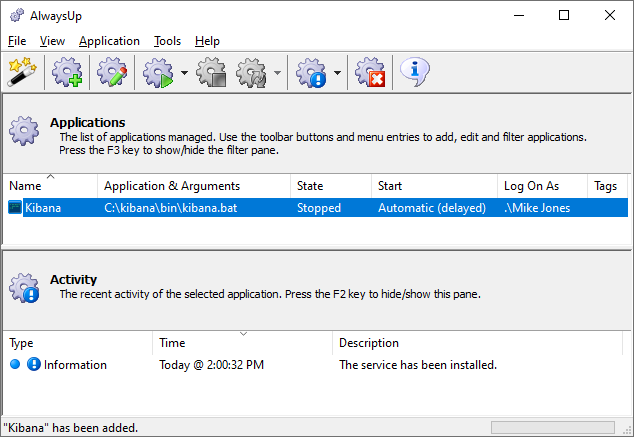 AlwaysUp will not be able to run Kibana as a Windows Service if you can't start Kibana from the batch file! 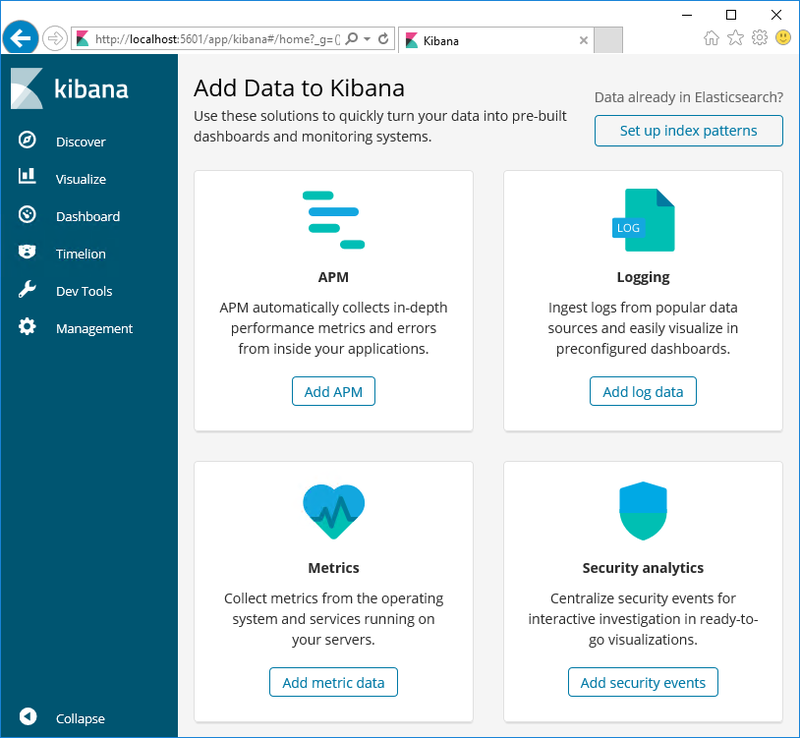 In the Application field, enter the full path to the batch file that starts Kibana, kibana.bat. You will find it the bin folder in your Kibana home directory. In the Name field, enter the name that you will call this application in AlwaysUp. We have stuck with the default of Kibana but you can enter something else if you like. 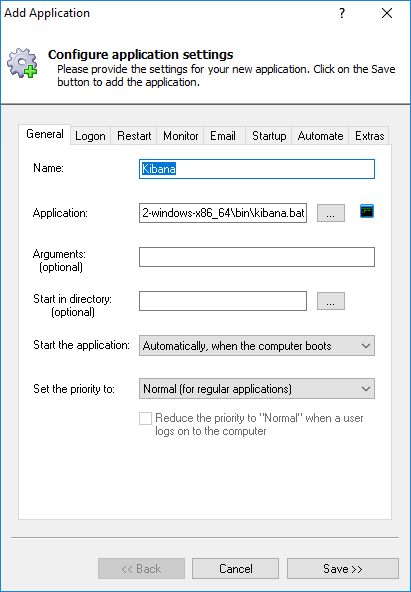 Check the box at the top and enter the username and password of the Windows account where you can start Kibana normally. Kibana uses Java, which requires a few environment variables to work properly. You must run Kibana/Java from an account where we know these environment variables are configured. 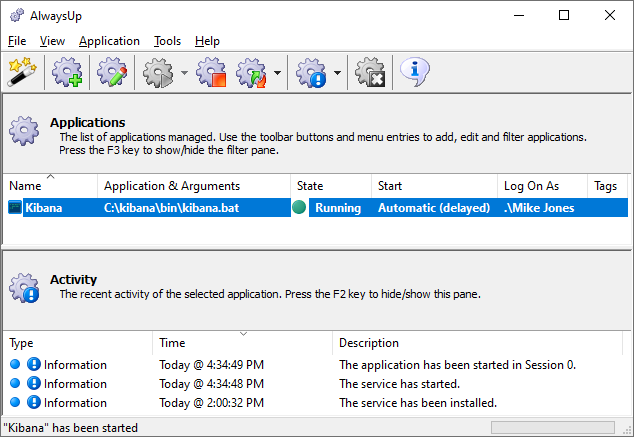 Check the When a user logs on, don't show the application's windows and tray icons box at the bottom. This will hide Kibana's console window (which you won't be able to see anyway, because it will be running in the background) and prevent Microsoft's Interactive Services Detection dialog from annoying you. 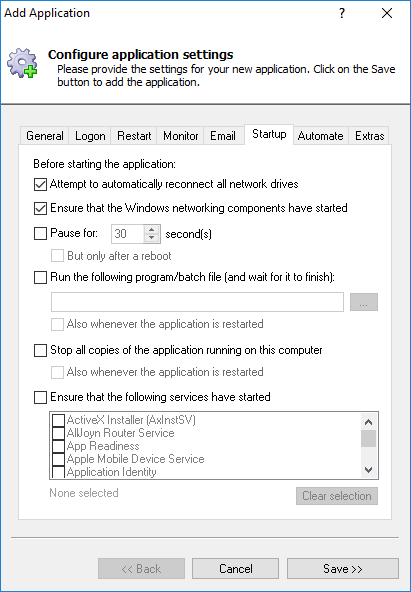 Switch to the Startup tab and check the Ensure that the Windows Networking components have started box. This tells AlwaysUp that Kibana needs the TCP/IP stack to operate. And finally, switch to the Extras tab. Here you will redirect the text from Kibana's console window to a file, so that you can review the details if there is a problem. 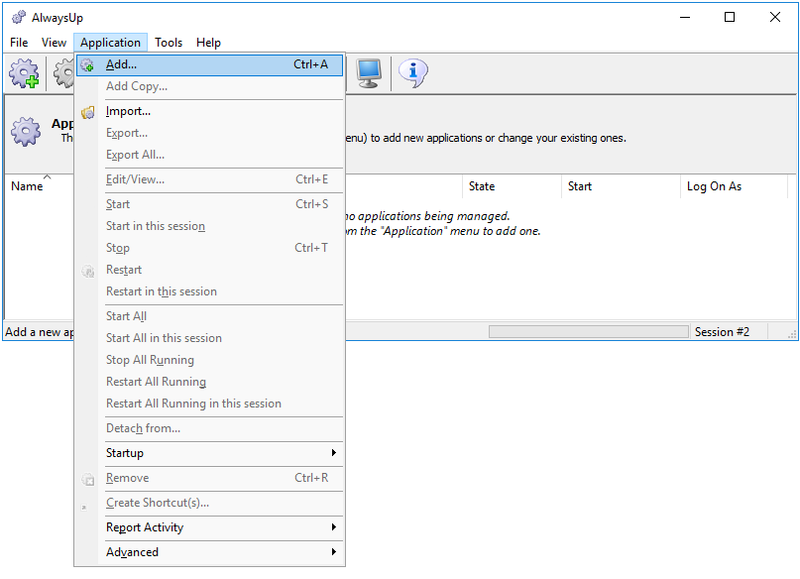 Check the Capture output to this log file box and enter the full location to the output file. We have placed ours in the Kibana installation folder (to keep everything in one place! ), but you can put yours anywhere you like. We are done configuring Kibana so click the Save >> button to record our settings. In a couple of seconds, a new entry for Kibana (or whatever you called it) will show up in the AlwaysUp window. To start Kibana as a service, choose Application > Start "Kibana". The entry's state should change to "Running" after a few seconds and Kibana will be active in the background. That's it! Next time your computer boots, Kibana will start immediately, before anyone logs on. We encourage you to edit the service in AlwaysUp and check out the many other settings that may be appropriate for your environment. For example, send an email if the Kibana fails, boost priority, configure a weekly report, and much more. Kibana not working properly as a Windows Service? From AlwaysUp, select Application > Report Activity > Today... to bring up a HTML report detailing the interaction between AlwaysUp and Kibana. The AlwaysUp Event Log Messages page explains the more obscure messages.